Moosomin MLA Steven Bonk has been named to cabinet. Premier Brad Wall announced a number of changes to the provincial cabinet Wednesday, including naming Bonk as Saskatchewan's new Minister of the Economy. Dustin Duncan becomes Minister of Environment and Minister responsible for SaskPower, SaskWater, the Water Security Agency and the Global Transportation Hub. Gene Makowsky becomes Minister of Parks, Culture and Sport and Minister responsible for Saskatchewan Liquor and Gaming Authority. David Marit remains Minister of Highways and Infrastructure while adding responsibility for SaskBuilds and Priority Saskatchewan. Greg Brkich becomes the new Government House Leader. Warren Kaeding becomes Legislative Secretary to the Minister responsible for SaskTel (Cellular and Internet Coverage) in addition to his current duties as Legislative Secretary to the Minister of Agriculture (Irrigation Expansion). 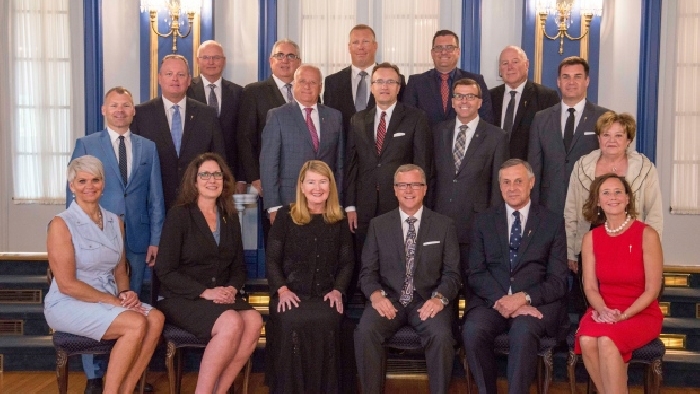 The overall size of the cabinet remains unchanged at 17, including the Premier.